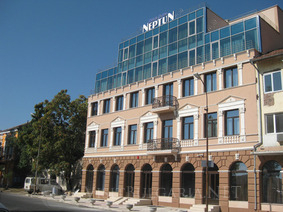 Location: Neptun hotel is situated in the central part of the town of Vidin just a few steps away from all business and public areas. The hotel is in close proximity to the bus station, the railway station and the river station. Neptun hotel has a splendid panoramic view to the Danube river and the Danube Bridge 2. - 4 maisonettes (43.2 m²) – two of them feature river Danube view. Room amenities: All of the rooms with unique interior feature private bathroom with bathtub or shower cabin, air-conditioner, mini bar, telephone, satellite TV channels, cable and Wi-Fi internet access. Wine & Dine: You can enjoy a delicious and freshly prepared meals in the stylish restaurant with 80 seats. You are able to relax with friends or have informal business meetings with quick professional service in the lobby bar with 38 seats. Spa centre: Neptun hotel is the first and the only one hotel in Vidin that offers a wide range of SPA services - indoor swimming pool, steam bath, sauna, fitness, massages, body & face therapies.